This intimate home away from home is perfectly located in the Lang'ata suburb on the outskirts of Nairobi, Kenya. Giraffe Manor is a relaxing haven neighbouring a wonderful giraffe sanctuary on the flourishing 140 acre land. A wonderfully dreamlike refuge among tall trees and animals alike to start or end a family vacation. This East African gem has become one of Nairobi’s iconic natural sites. 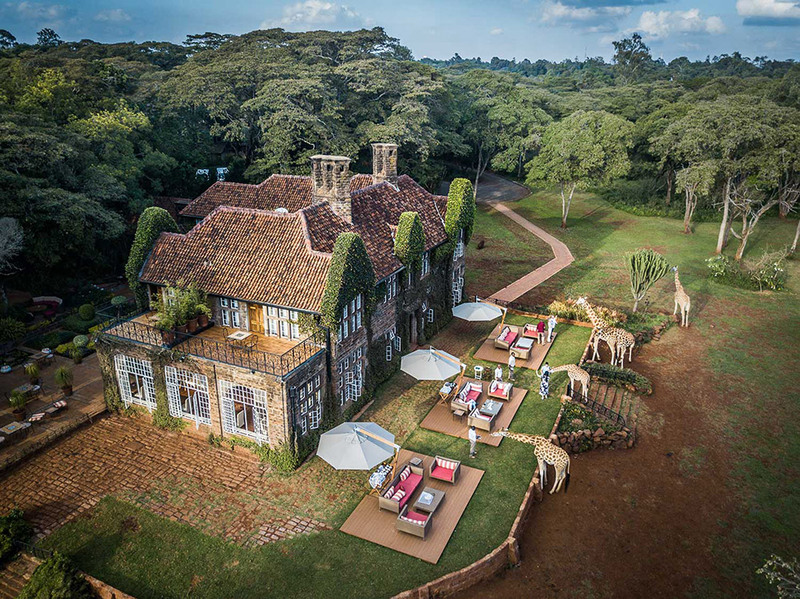 This exclusive boutique hotel owned by The Safari Collection is set on 12 acres of private land within the abundant 140 acres of forest home to the Rothschild Giraffes. The manor is one of Nairobi’s most iconic buildings and takes guests back to the wonderful 1930’s with its extraordinary appeal. 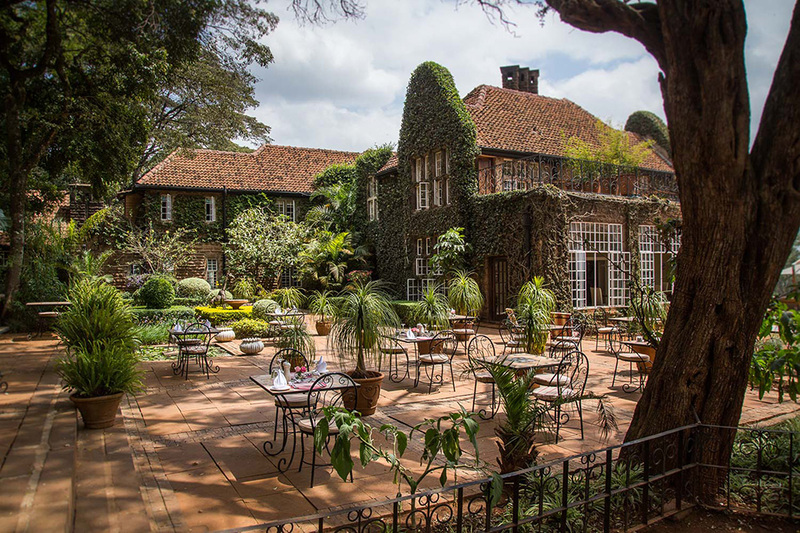 Reminiscent of the first European travellers that visited Nairobi, Giraffe Manor channels this history through their stately front, elegant choice of interiors, garden-facing terraces, plentiful tea spots and luscious greens. Giraffe Manor has even named one of the twelve rooms after the author Karen Blixen who so beautifully writes of Africa. The manor’s rooms reflect a certain colonial regency that include both elaborate and ornate features. The twelve rooms are beautifully furnished with romantic décor such as four-poster beds and neoclassical amenities in the en-suite bathrooms in a building that dates back decades. While the furnishings are quite charming and the attention to detail magnificent – right down to the chess set – what sets this accommodation apart from the rest is not where you’re staying, but rather what you see! What makes this property a justifiable bucket-list splurge is the main attraction – the resident herd of Rothschild giraffe that casually wander around outside your bedroom window and make their morning visits during breakfast. 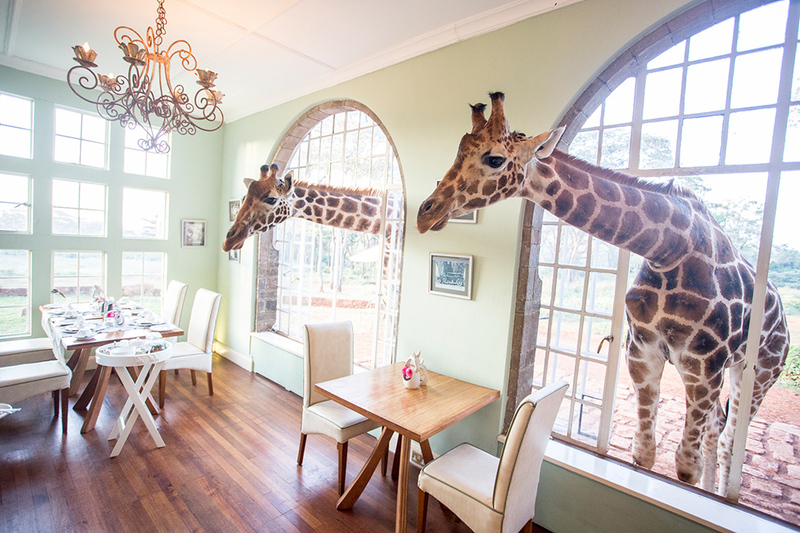 Breakfast has never been more fun and interactive than at Giraffe Manor. Not only is the food fantastic, you are likely to be interrupted by one of the sociable giraffes poking its head through the window. With only 1671 Rothschild giraffes estimated in the wild, being in such close proximity to these friendly, towering animals is a once in a lifetime opportunity. The giraffes are wild but are well aware that they are adored by guests and that grass pellets are available during breakfast and afternoon tea. Each with its own discernible character, these elegant creatures are always keen to be hand fed by guests, creating long-lasting memories for them! Giraffe Manor is situated approximately 27 kilometres from Nairobi airport and is accessible via private car or transfer. It is the only place in the world where you can feed and photograph the giraffe from breakfast table, or view them from your bedroom window. Bask in the romance of a gourmet candle-lit dinner surrounded by sweet-smelling orchids. 180 bird species to admire.